Serial killer Kenneth Bianchi terrorizes Los Angeles between October 1977 and February 1978, but the cops don't know that his own cousin serves as his accomplice. Known for his extreme beliefs on Christianity, socialist politics and racial equality, Jim Jones becomes infamous for leading a mass murder-suicide of over 900 of his followers in Jonestown, Guyana. Dr. Richard Shepherd analyses the official autopsy reports of various celebrities to determine their cause of death. "Things like that don't happen here," they always say. These are the shocking murder mysteries that haunt small town America. We'll discover the dark secrets that lie just beneath the outwardly wholesome surface of America's heartland. A look back at famous cases from the past. 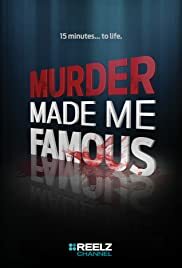 Murder Made Me Famous shares personal accounts from victims' family members, jurors, members of law enforcement and journalists involved with each case to give viewers an intimate perspective and disclose new information. Featured commentator for every episode is author and PEOPLE crime reporter, Steve Helling, who has covered several high-profile crime stories including the Natalee Holloway and Laci Peterson disappearances. Amazing! A 9.5 almost unheard of rating. The first six people voting on this series are obviously connected to the series in some way. "Murder Made Me Famous" doesn't start until Saturday Sept 6, 2015, and Airs Thu. Aug. 27, 11:00 PM on REELZ. it's only August 26 early morning right now. It really makes me angry when I see a stuffed ballot box rating. I come here to see what the public thinks of the movies and TV shows I look up, so I can decide whether or not I want to watch. This doesn't mean the show is no good, it just means the people connected to it don't have enough confidence in it to allow a real rating. This is the first time I've ever posted on IMDb and I only did it because I was so darn mad at seeing this kind of behavior yet again. Have some confidence in your own work people! 7 of 19 people found this review helpful. Was this review helpful to you?